Villa is built in an amphitheatric area of Ancient Epidavros where you can have a marvellous view of the town and the sea. villa is only 400m from the sandy beach! Vila is 240sm and it has 3 levels. Level A is 85sm and includes 2 nice bedrooms,1 bathroom,1 livingroom(TV) and a fully eqouipment kitchen where you can cook your food etc. Level A has not any inside contact with levels B-C. Beside of level A there is a storage room where there is a washing clothes machine. Outside of level A there is a large traditional stoned stairs which leads you at the outdoor of levels B-C.
Level B is 100sm and includes a w.c, a fully eqouipment kitchen (plus microwave and dishwasher) again for your cooking, a large living room with TV and DVD, with large verandas so to enjoy the fantastic view of the sea while having your drink/dinner. There is an inside stairs which leads you to level C.
Level C is 55sm and includes 2 large bedrooms,a large bathroom and again large verandas for the incredible view! Outside of the vila there is a large garden of 2000sm of grass, big trees and nice flowers, parking for your car, shower, private barbeque for steak nights and the most important your private swimming pool all day and night in use. So you will relax at your holidays and enjoy your privacy! 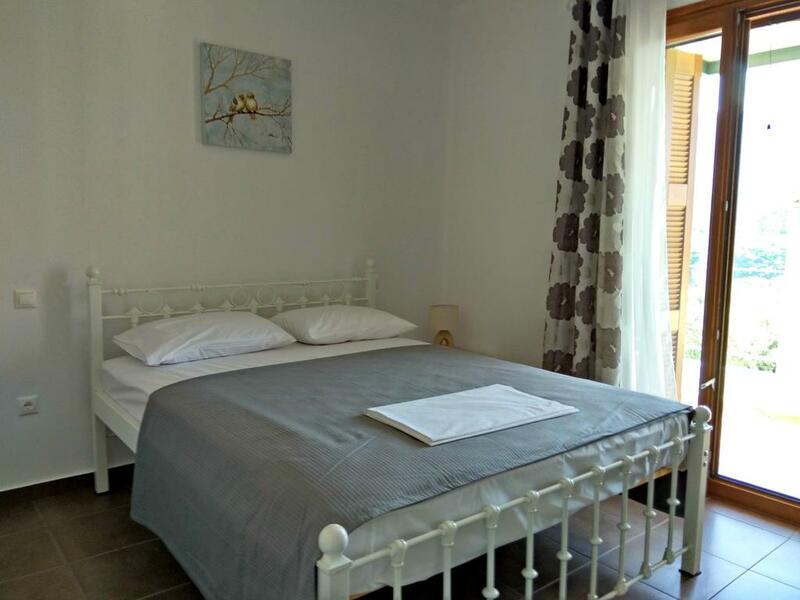 There is internet access at the vila included at the price and of course sheets and towels are included at the price except the towels for swimming. Epidavros is at the centre of the most historical area of Greece as here you can visit the 2 ancient theatres of epidavros where you can see music festival at the small one and ancient plays (ancient comedy/tragedy) at the other. You can visit also the museum of epidavros and the temple of god asklepios the ancient god of medical care in the ancient Greece. At 20min from the villa you can visit Nafplio the first capital of Greece with the 3 museums,the castles of palamidi and bourtzi. At 25min from the villa you can visit the ancient mychnes palace with the grave of king AGAMEMNON(WAR AT TROY) ,the castles of ancient tiryntha and ancient argos of king DIOMIDIS(TROY WAR). At 15min you can visit and walk the volcano at methana island. At 20min from vila you and your kids can visit the biggest ranch of GREECE where there are many animals like horses, ponnies, etc and many sport activities! You can also visit the waterland-watercity at 40min from vila at isthmos of KORINTHOS. Vila is only 1 hour and 15min driving from the airport of ATHENS and you drive a new national road outside of ATHENS.